In a world where AI is advanced enough to create convincing chat up lines, a fake Donald Trump that fooled his wife, ad scripts for Lexus, and even craft beer, the question is not how will it affect advertising, but how can advertisers leverage it to best effect? "We’re here to prove that AI is not approaching. 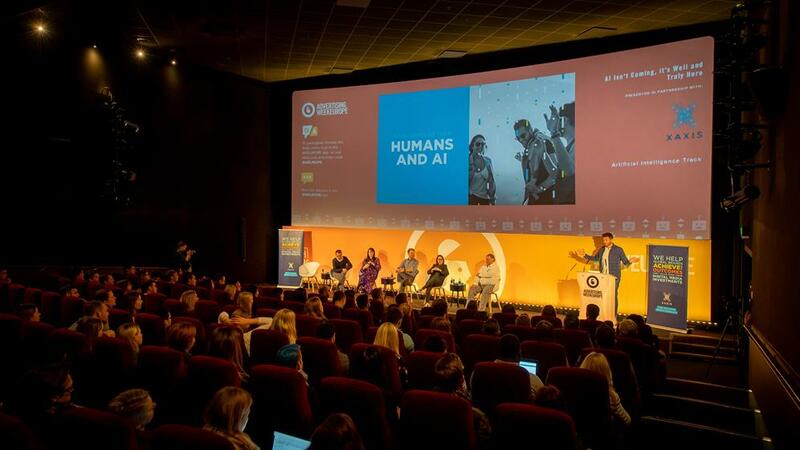 It’s alive and kicking in the European digital advertising industry," said writer and broadcaster, Rick Edwards, kicking off an exploration of AI in advertising brought to the stage by Xaxis on the first day of Advertising Week Europe 2019. Edwards led an interactive "head or tails" quiz around true or false scenarios that revealed the extent of AI experimentation - and the expert guessing skills of some audience members. In advertising, AI is mainly used to automate time consuming activities at the moment, but that is changing, said Paul Martin, vice president marketing science at Xaxis (far left on panel above). "It’s becoming more mainstream and allowing clients to leverage machine learning for better campaigns." This includes areas such as campaign strategy and exploring how to deliver specific outcomes. Ford is working with Mindshare to uncover the drivers of purchase intent and has been able to cut the cost per action by 20%, said John Pickles, digital marketing optimisation, programme lead at Ford of Europe (far right on panel above). However, he warned that outcomes were contingent on data quality, and that the technology did not always produce great output, such as when Microsoft Tay started producing offensive tweets and had to be shut down. "Garbage in means garbage out," he said. "Companies have to test and learn, and AI gives the ability to do this at speed. Start small, learn and then roll it out when you’ve cracked it." Mike Campbell, director WPP at AppNexus (middle on panel), highlighted how, in the Netherlands, a financial service company pitted AI against one of its best traders, and the machine delivered a 13% better performance. By freeing people up from tasks that tech can do better, the outcome is an uplift all round as people can focus on more valuable tasks. Skills development could be a barrier to AI uptake, said Ruth Zohrer, global client lead, BBVA at Mindshare (second from right on panel). "Education and skills sets are barriers. 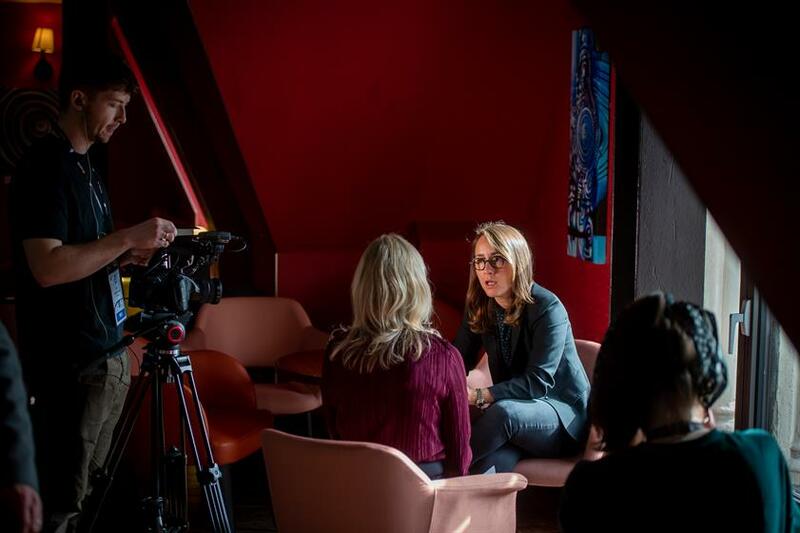 The industry is split between technologists and artists – there needs to be a broader training." 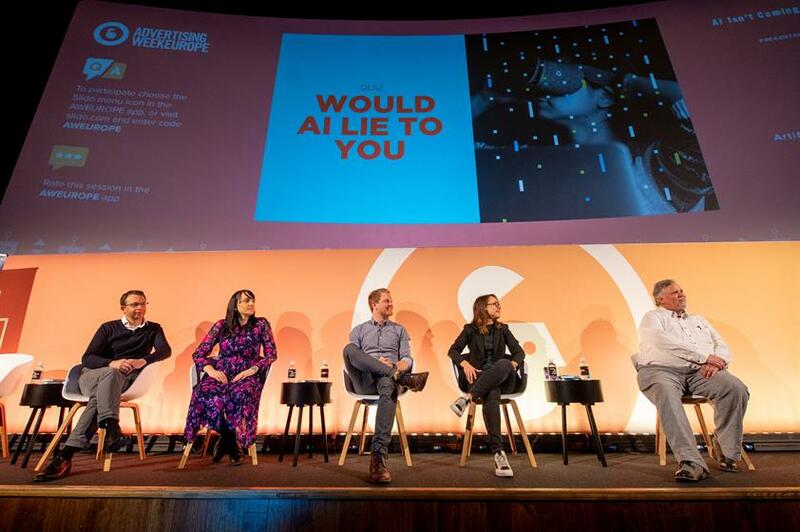 Although everybody wants data scientists to harness AI, Natasa Tintor, agency group director, Mindshare and m/Six at Xaxis UK (second left on panel), said skills would need to spread throughout organisations. "You also need people to interpret and explain things for the client, and people to manage the campaigns. There are many roles and you can train the existing workforce to use this new information." Optimum performance of AI will ultimately come through achieving a balance between technology and human inputs. Despite the promise of machine learning, technology at the moment cannot achieve much on its own. Companies need smart data scientists and people who understand advertising and behaviour to get great results. A note of caution was raised by Zohrer, who pointed out the potential for human bias to contaminate AI systems. "We are training machines to think like human beings but we're not training humans to think like human beings. In fact, we are concentrating less on teaching humans about critical thinking and ethics. Machines can do things quicker but there is always a role for humans to understand more nuanced questions." With Microsoft announcing an AI school for business leaders in the past week, AI is about to climb the business agenda. "As those in power become better informed, this will lead to broader problems being addressed by AI," she said. In other words, the machines still keep coming.